You've waited all year, HONEYBELLS will be HERE in January.....time for the incomparable taste of Gregory's Honeybell Tangelos, Zip off the deep, red-orange peel & there's the reward...the sweetest, juiciest piece of fruit you'll ever taste! Try just one Honeybell & you'll know why the demand for this fruit is so great & why the supply always seems to run out. Honeybell lovers know that since these beauties are available for just a few short weeks in January they'd better ORDER EARLY, and so should you. Don't be left out! You won't be disappointed. Only one Honeybell was broken. All the rest fine and taste great. Sugarbells are better. Didn't order those this year. Delicious and juicy. Also easy to peel. They are huge!! He doorbell rang at 7:30 am and there they were....The day they were suppose to arrive. They arrived on time, juicy and delicious! I just love January because that is when the honeybelles are delivered. I order them also for my children who anxiously await the arrival. I have quite a few people "hooked on honeybelles" They are fabulous!!! These were purchased as a gift for my family in Indiana, and they've done nothing but rave about how wonderfully juicy and sweet they are! Love Honeybells. 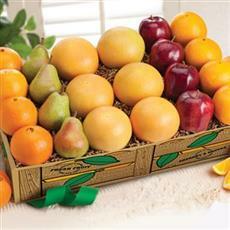 Realize that the balance between underripe and over ripe is tough when you are shipping the product. I think your firm does a good job and stands behind your product when errors occur. I sent these to a relative. They said they were delicious and they sent me a picture of the box they arrived in and said they were packed very well. They loved them. There was 1 half rotten one and 2 that I don't think where honey bells..they where not as juicy and mealy. The rest where great. Excellent...arrived a little sooner than expected but we were home to get them into house...not a below freezing day. Taste and texture...wonderful! Received Duncan Dancies today and Honeybells yesterday. Sweet and juicy fruit. Excellent quality. Everything arrived on time and was very fresh! Our oranges were absolutely delicious. One was spoiled, however, and we had to throw it away. My honey bells are delicious. They are juicy and sweet. Every single orange was perfect! Thank you! I had Babybells sent to my son's family for a late Christmas present, and they devoured them within a few days. Ashamedly, I have not tried them myself, so I am going to gift them to ME for my birthday!! At Christmas I ordered a box for my Mom and one for me. They were delivered on time and delicious and we have reorder another two boxes which would indicate how fast they left. Another for my mom and one for me. They arrived on the day I requested them to. They are very juicy and sweet. Two were rotting but the rest are fine but not as big as the ones we usedto receive many years ago from a Naples grove now closed. I was a longtime Cushmans customer but fruit and service was terrible once Harry & David took over. I am thrilled with Gregory's fruit and service!! You have my business long term!!! the Honeybells were great! but I thought I had signed up for a "buy one--Get one free." Received this as a gift for years; have picked up the custom + 1 for myself. Delicious, as always, plus new recipient raved about the product. Always a hit, and always anticipated. Thanks! They were good what is there season too. The honey bells were Swee and juicy. 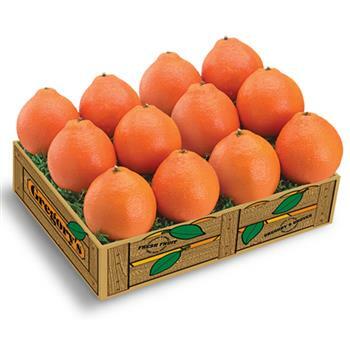 I sent Blood Oranges as a gift. I was told that each one was a perfect juicy fruit. Very happy with the order and delivery. One orange was rotten, otherwise the rest were fine. Thanks, Deborah. Very, very juicy, but not very sweet like I thought they would be. Fabulous company On time and delish! 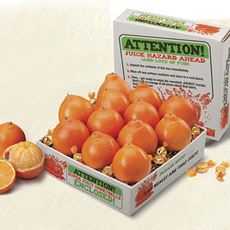 I've been ordering here for the last few years and this year is by far the best honeybells-juicy, easy to peel and every last one of 4 trays was delicious...I still have 1 tray left. Shipment packing was perfect. Honeybells very good. Been ordering for years. Generally happy with order. One rotten orange in the bunch. First time we tried Gregory's and very pleased with the product! Will order again next year!!!!! Loved the honeybells we received. Product was so fresh and only the highest quality. Thank you!! Quality fluctuated. Some oranges were great and some were soft and or dry. The honeybelles were so good and arrived here two days earlier. No issues regarding delivery. Order was delivered at the right home address. The fruit is excellant arrived in great condition! I was sorry to see my supply of Honeybells disappear. I love them. Every one was a treat! These are very juicy and tasty. We have had some bigger ones from another company but these are very good. I try & get these every year. I keep 3 trays & share the other 1 with my two neighbors they love'em two. Now I need to get something else. Honeybells are my favorite orange. 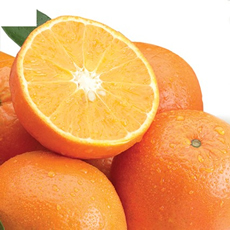 Your oranges were of nice size and heavenly sweet. I am still enjoying them. Excellent fruit this year. only 1 molding out of the entire batch. very good honeybells this year. Better than last year and we were able to get them later in the February. Some were soft but still sweet. I did not see these but the gift recipient said they were very good. This was my third purchase this year as gifts for my parents and each one was high quality fruit. No spoiled oranges as I received from a different suppier. Wasn't sure if the timing was off or my anxiety made me feel so, but was over all great product. Only had two bad ones out of 48. Acceptable to me. The honeybells were disappointingly small and not nearly as sweet as others I received this season. Recipient who received the 4 trays was very delighted with her gift. Absolutely can't go wrong with Honeybells. It's going to soon be time to go through withdrawals when I can no longer get them. Hopefully I can get at least one more order in. I bought these for my mom in January. She said they were great. Unfortunately, one was overly ripe and I contacted Gregory's. They immediately sent her a replacement plus more. The customer service is terrific. I have placed several orders through Gregory's and have not been disappointed. Fresh, juicy fruit arrives each time. I ORDERED 2 TRAYS FOR JAN. DELIVERY THAT WERE GOOD, BUT THE ORDER RECENTLY RECEIVED - WESTERN HONEYBELLS WERE FAR TASTIER. not much to say we ate all of 'em. and they smelled good too. Although they are thicker skinned and not as good as January, we are thrilled to receive them in April. Still better than other types of oranges.